The latest iPod Shuffle to come out of Cupertino has a big hill to climb and, so far, things aren’t looking great. Any which way you look at it, this is a dud, but a magnificent one all the same. For starters, the price to storage ratio is skewed in the wrong direction. One quick look at Amazon and you’ll find a handful of 4GB MP3 players for much cheaper with screens, controls, FM radios, voice recorders and the like. Now, you might argue that they’re much bigger than the Shuffle 2K9, but so what? There comes a time when being that small is completely unnecessary and uncalled for. I remember a time when the mobile phone market in Korea and Japan boasted cell phones that weren’t much bigger than a book of matches. That fad faded fast and we likely won’t ever see it rise again, but does that apply to Apple and its new Shuffle? 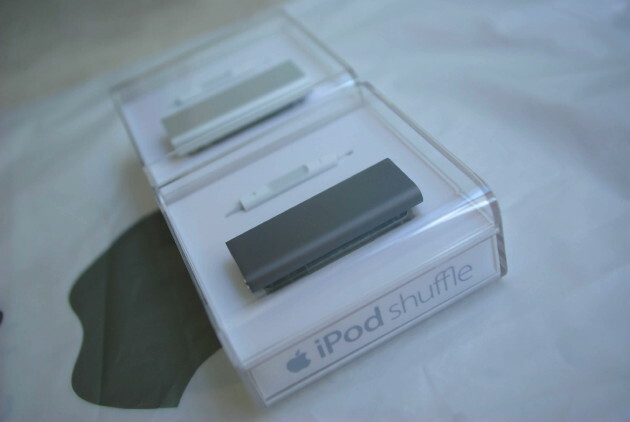 Let’s start with what Apple did do right with the Shuffle 2K9. It’s incredibly tiny and the recent teardown shows just how crammed it is inside. For an Apple product to be released these days without some sort of flair or pronounced logo is shocking. Save for the etched Apple on the clip, the Shuffle 2K9 just looks like, well, nothing at all, really. It actually looks like the hundreds of flash drives that I pick up from press conferences and other events. But it’s not outright pompous and arrogant, so I appreciate the way it looks. It doesn’t scream, “look at me” or does it? The on/off and shuffle/repeat buttons from the second generation Shuffle have been combined into one for the new model. It now switches between shuffle, repeat, and off, whose symbols are etched onto the back right below the switch. They’re not very visible and unless you have the eyesight of an eagle, you’ll probably have to bring it within six inches of your nose. Or maybe I need a new prescription. Battery life is said to be 10 hours, which is two hours short of what the previous gen was said to have and yesterday we logged about eighth ours. There’s a single LED next to the control switch on the Shuffle that switches between green, orange and red. If you toggle the Shuffle/Play in Order/Off switch off and then back on really quick then the little guy tells you what percentage battery life you still have. Now let’s get into what I don’t like and probably what you won’t like either. The earbuds, as they are, stink. Maybe it’s because I have the luxury of trying out high-end in-ear headphones from companies like Shure, Ultimate Ears or Etymotics, but I think we can all agree that Apple’s earbuds are nothing to fawn over. And since all ears are different, they just don’t seem to fit very well. But, fit aside, the sound quality just isn’t there and never has been there. When the volume is maxed out it gets pretty damn loud, which is the cause of hearing loss among America’s youth today. I tested my iTunes purchased tracks against CDs that I ripped and old MP3 tracks from my Napster days. Sound quality on the first two were perfectly fine and didn’t crackle or distort at max volume but, good lord, did that old low-bit rate track sound awful. And there are no foam covers. Maybe Apple ditched those long ago, but I haven’t purchased an iPod in, well, ever actually. My first iPod, which was the iPod Photo, was a gift. And other than my iPhone, I haven’t purchased one since. Apple decided to include a simple USB to 3.5mm jack instead of the dock that came with the previous model for the 3rd generation. Don’t lose it or you’ll have to shell out another $19 for a replacement. Or you could get the $10 from Dexim. And I’m positive there are cheaper alternatives as well. The control module that we’ve all been lambasting since the announcement is pretty horrendous, although it’s not as chintzy as I first thought. I still think people will break it, though. The volume controls give a fair amount of tactile feedback as you’ll feel the ‘click’ if you’re holding it in the ‘meat’ or finger print section of your distal phalanges. If you try and click the controls with the side of your finger or middle phalanges then your nerves might not pick up on that physical click. There are various ways of holding the control and we don’t all do it the same way so you’ll have to figure out what’s best for you. The on/off or center control has the most give and gives the greatest feedback. But it’s probably the weakest section in terms of rigidity. Skipping tracks requires you to double click the center button with three clicks to go back but if you’re running or even just walking then you might misclick and raise or lower the volume. The control module is just too small and it might be far too cumbersome to use for those with sausage fingers or meaty paws. As I mentioned yesterday, it would be better suited closer to the earbud split. The VoiceOver feature was the other big thing to come out of this new model and I’m still on the fence about it. Sure, it’s nice that Apple now allows playlists to be transferred to the Shuffle, but isn’t that what makes the Shuffle what it is? I was always under the impression that it was just one playlist that could be customized whenever you pleased. Maybe it’s the jump in capacity to 4GB that caused Apple to unlock that ability. I mean, it does hold around 1,000 songs now, but having to listen to the little man in the Shuffle to try and get to a specific playlist is a bit tedious. However, he does a fine job pronouncing artist and track titles that might be hard to say for non-native English speakers. And I say he because those with a Mac get a man while you Windows users get a lady who can’t say anything right. I threw on a couple tracks from Coeur De Pirate and a French lady came on. One other thing I noticed was that VoiceOver was speechless when it came to tracks with no info. I, personally, don’t ever make playlists, but I know people that have playlists for every little facet of their life. I can’t imagine sifting through each of those playlists on the Shuffle. You have no other choice but to listen to the track title, artist, and “all tracks” before it even gets to your playlists. That might not bother people but it’d be a real nuisance for someone with ADD. It’s definitely not a “snap” to choose different playlists like Apple says. Including playlists is more of a detriment than it is a benefit for potential Shuffle owners, in my opinion. Not to mention the fact that you can’t make an On-the-Go playlist from the Shuffle itself. So, after a full 24 hours with the new Shuffle 2K9, I can’t say that I’ve changed my mind from my initial hands-on. The cost outweighs the benefits and there’s nothing really cool about this new model. VoiceOver certainly won’t cause a moth-to-flame effect and the use of Apple’s earbuds is definitely the biggest hurdle to overcome. And even if an adapter is put on the market, the Shuffle itself is nothing special and you can get a 4GB player with better features for much cheaper. I prefer to drag and drop files rather than going through iTunes thanks to my Samsung S2. I’ll be returning the Shuffle and eating the 10 percent restocking fee. I suggest you save your money or opt for the Nano if you really want an Apple MP3 player. The new Shuffle just isn’t worth the money. I mean, what happens when you want to hook up your Shuffle to a stereo or your car stereo? Update: I just tried using the USB to 3.5mm doodad from my Samsung S2 and as expected, no dice. F you, Apple.